Bridging and improving relations between Jackson County officials and the Prairie Band Potawatomi Nation was one of the late Jim Potter’s goals, and in his lifetime, he managed to rise above and beyond that goal. Known not only for his work on the Prairie Band Potawatomi Tribal Council and within the nation, but also for his work in non-tribal endeavors throughout the county, Potter is one of this year’s Holton/Jackson County Chamber of Commerce Hall of Fame inductees. That, according to his fellow Tribal Council member and longtime friend, Steve Ortiz, is something Potter would be happy about. “It shows that we’re a part of the community, and I know he’d be excited about that,” said Ortiz, who retired from the tribal council earlier this year. He added that Potter would be proud to stand alongside fellow Potawatomis who have also been inducted into the Hall of Fame, including Roy Hale, the late Francis Jensen and the late Vestina Nonken. Over the past two decades, Potter had served as a member of the Tribal Council, first as its treasurer and then as its secretary, and he served on the tribe’s health board and as the tribe’s representative on the National Congress of American Indians. He was also instrumental in the development and growth of the tribe’s casino and played a key role in bringing back the tribe’s annual powwow. But Potter’s work also extended beyond the boundaries of the Potawatomi nation, including serving as a president of the Jackson County Economic Development Corporation and the Jackson County Tourism Council and on the Banner Creek Science Center board of directors. He also served in leadership positions with the Mayetta Area Business Association and the Stormont-Vail Foundation. Born in 1958, Potter grew up on and around the Potawatomi reservation and graduated from Royal Valley High School in 1976. Ortiz said he first met and befriended Potter in the early 1970s, when the two of them would go hunting with other friends. As a youth, he and future wife Patricia Miller — whose mothers were best friends — would go to powwows all over Kansas and Oklahoma, Kitchkumme said. Eventually, Potter would propose marriage to Miller, but would wait a year until she finally said yes, Kitchkumme said. They were married on June 6, 1992. That was the time that the tribe’s casino was brought into the Harrah’s family of casinos, water service to the reservation was improved dramatically with the extension of a larger water main from Jackson County Rural Water District 3 and relations between tribal and other governments began to improve. Potter, Ortiz said, was a key player in all three of those developments. But it was Potter’s commitment to improving intergovernmental relations that garnered him an incredible amount of recognition outside the boundaries of the reservation. Potter’s communication skills made him an effective person in helping to improve relations between the tribe and not only the State of Kansas, but also Jackson County, Ortiz added. He and Pam Bowman, who served as Potter’s administrative assistant for 12 years, described Potter as a “bridge” between the tribe and county officials. Much of it had to do with Potter’s genial nature, Bowman said. 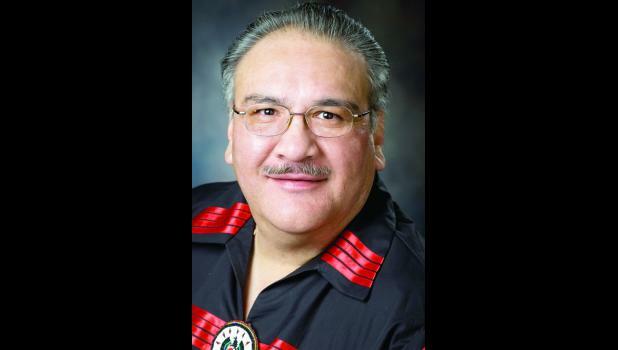 From 1996 to 2004, Potter served as the tribal council’s treas­urer, then served the next two years as a board member before serving as the council’s secretary from 2006 to 2014. During that time, however, Bowman noted that he was also a key player in the 1998 resurrection of one of the tribe’s biggest events — its annual powwow, and he served as the powwow commit­tee’s co-chairman for several years. Potter, whose term as tribal council secretary was reportedly set to end earlier this year, was getting ready for this year’s powwow on June 11 when tragedy struck after leaving the powwow grounds on his motorcycle. His motorcycle struck a deer in the road, then went into a ditch, where he reportedly died from his injuries. Indeed, in their years together on the tribal council, anytime Ortiz wanted a “straight answer” from Potter, he would call on the “wet your finger” phrase from their hunting days in the 1970s. Potter will be honored alongside Bill and Debra Brown, Mike Ford and Brad Stauffer at the 2015 Chamber Hall of Fame induction ceremony, which is scheduled for February.